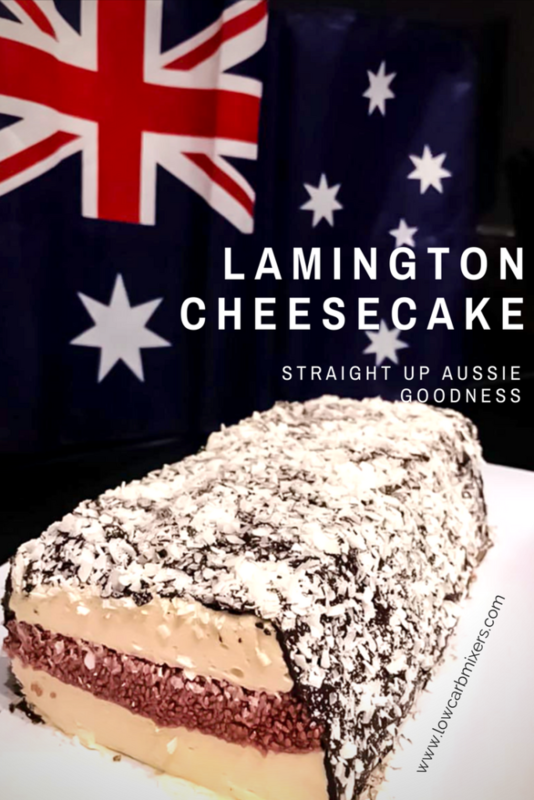 Mad Creations Keto Lamington Cheesecake, should be on everyone’s menu this Australia Day. I knew this recipe would be amazing before I even tasted it, and boy was I not wrong. Oh it sure is good. So what that my version came out a little messy, I will make it again just not today, as I have so much on. So that is why I am asking YOU to make it, and send me your photos. I plan on making a collage of everyone’s pictures and using your images for my pinterest and website images. Plus, the one I personally love the most that is shot in a high resolution (preferably raw) photograph will become the feature picture for the website and possibly a planned Australian Cookbook. 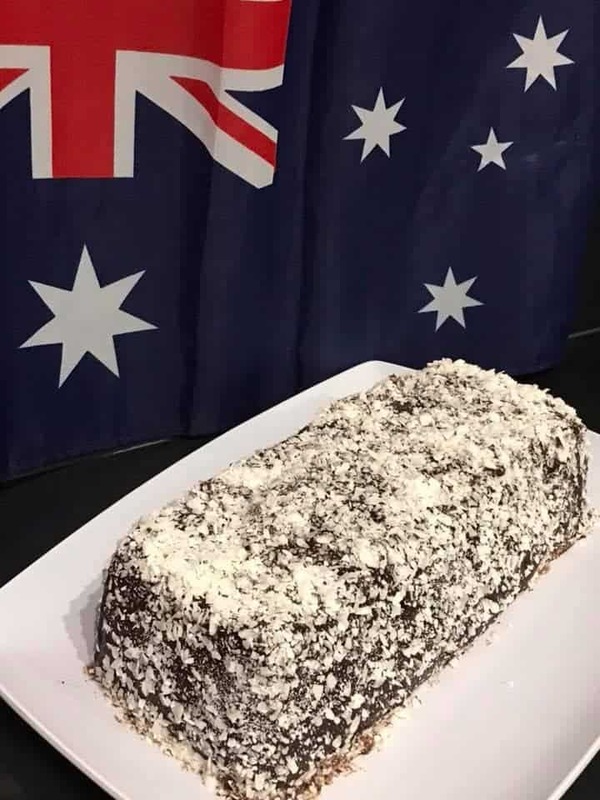 So please make this, for Australia Day and submit all your images in a separate post on the Lowcarbmixers Group with the tag #lcmfeature. I would love to see your original version too, these could easily be done in frozen balls, bars, spring form, bite size. This is truly one amazingly flavoured cheesecake! Prepare 20cm x 10cm loaf tin with cling film to cover entire tin. 30 seconds/speed 5. Stir gelatine and water in a glass to combine. Microwave 30 seconds on high and add to cheesecake mixture. Blend 30 seconds/speed 5. Pour half of the mixture into prepared loaf tin, smoothing off top, and pop into freezer while you prepare the jam. Place strawberries into microwave safe bowl and microwave on high for 90 seconds. Push strawberries throw a sieve and discard seeds. Stir in chia seeds and place in fridge for 20 minutes or until thick and jammy. 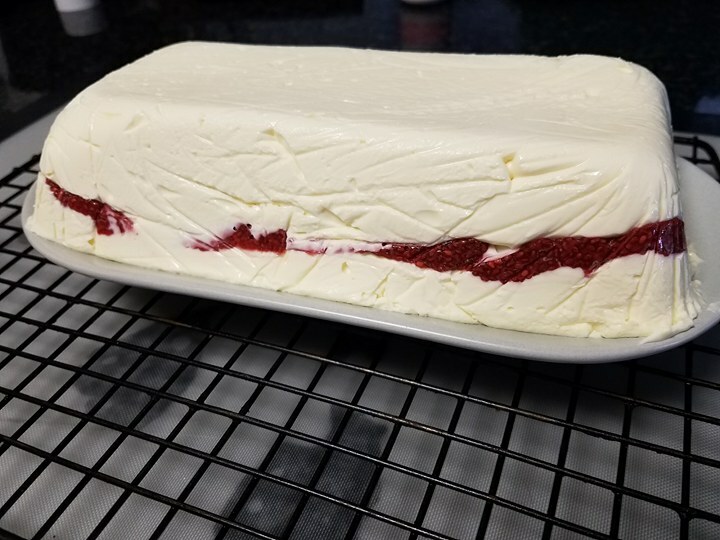 Spread a thin layer carefully over the top of your cheesecake, then top with the other half of the mixture. (If you spoon it all over the cheesecake then smooth off this will avoid and ripples of the jam. Pop back into freezer for 30 minutes. Turn out cheesecake onto serving plate (gently lifting the side of the cling film then placing plate on top and flip it. Peel off cling film. Melt chocolate and oil in microwave for 80 seconds or until melted. Top the cheesecake with melted chocolate quickly spreading with a palette knife (or spatula) and sprinkling with coconut. Refrigerate until set. Remove 20 minutes before serving and use a hot knife to cut cleanly. The only changes you need to do to the above recipe is mix all the cheesecake ingredients in a mixer with a paddle attachment. (if sweetener is coarse, you can use a mortar and pestle to grind into a finer consistency before adding although this is not essential) Follow all other instructions as above. This recipe can be made ahead and kept in the fridge for up to 1 week. This would also work perfectly in single portions using a bar silicone mould or in small jars. 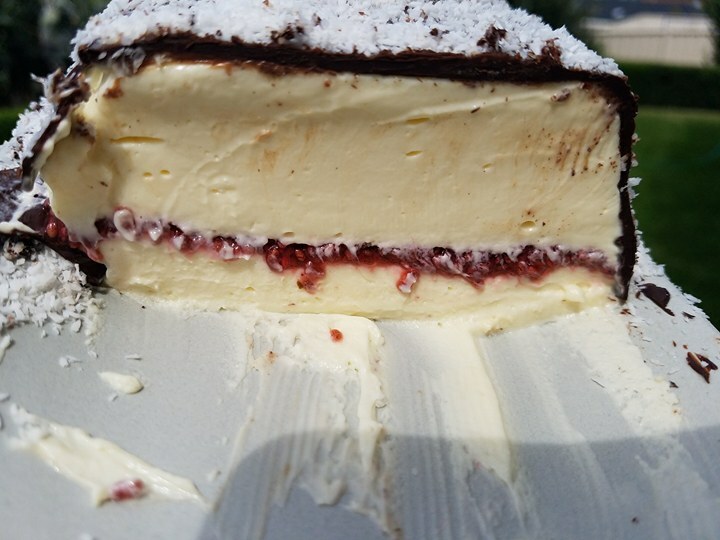 This cheesecake is not only for Australia Day. Its so good!